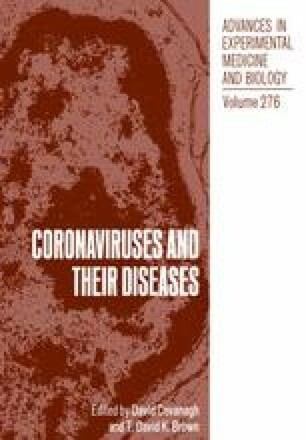 Coronaviruses exhibit strong tissue tropisms and species specificities, and the molecular mechanisms for these tropisms are of considerable interest. For mouse hepatitis virus, strain A59 (MHV-A59), a solid phase assay was developed to detect binding of virions to plasma membranes from normal target tissues of susceptible mice (1). Using a virus overlay protein blot assay, MHV-A59 was shown to bind specifically to a 100 to 110K protein from liver or intestine membranes of MHV-susceptible BALB/c mice. The specificity of virus binding was demonstrated by the observations that other enterotropic murine viruses did not bind to the same membrane protein and that MHV-A59 did not bind to any proteins from intestine or hepatocyte membranes from SJL/J mice, which are highly resistant to infection with MHV-A59 (2,3). Thus, SJL/J mice may be resistant to infection with MHV-A59 because the virus fails to bind to its normal target tissues, possibly because the virus-binding moiety is absent from the SJL/J plasma membranes.